Like hairstyles and makeup, how we choose to rock our nails is a form of self-expression. From blinged-out Cardi-B digits to more subdued neutral-toned styles, our nails have the potential to express quite a bit about us. While we live for a fresh mani, having to frequent the salon can be annoying which is probably why intricate press-on nails have boomeranged back into popularity. Unlike the press-ons of our childhood, today’s versions come in an array of eye-catching designs that can withstand washday. To say they’re now a go-to for us, either in-between manis or in lieu of them, is an understatement. 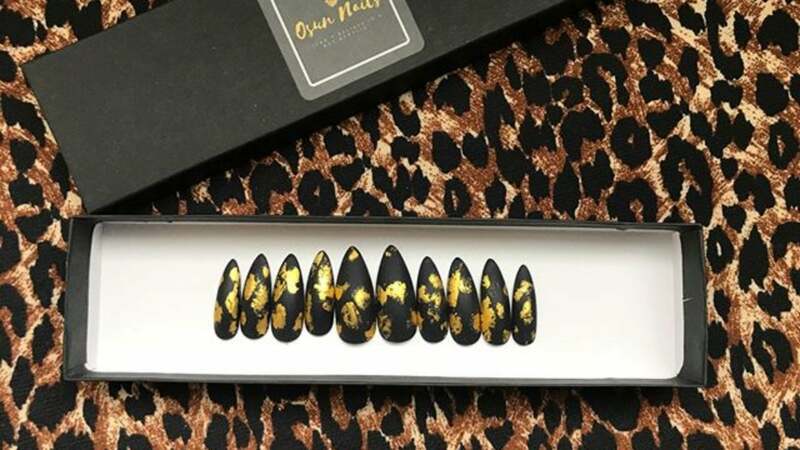 When we discovered the recently launched Black-owned press-on nail brand, Osun Nails, we couldn’t wait to chat with Yewumi Awolola, the brand’s founder. We’ve officially launched. The link to order is in our bio !! As a current cosmetology student, Awolola says beauty is her whole world. “I’ve always loved fake nails but once I started cosmetology school I found that I couldn’t get them as long and extravagant as I wanted, so I decided to make my own that I can take on and off whenever I wanted and share it with the world,” she tells ESSENCE. Yewumi credits rising concerns about nail health for the sudden rise in enthusiasm for press-on nails. “Some people don’t like how damaging acrylics are. This was one of the reasons that I kept getting messages about how happy people were that I was offering an alternative,” she says. Not to mention salon visits can get pretty pricey. “Full sets can be costly a lot of times and people don’t want to spend all that money on something that doesn’t last for that long. People also want to have the freedom to be able to apply and remove fake nails by themselves,” says Awolola. A set of Osun Nails rings in at a very affordable price tag of $15, the cost of your average manicure and her sleek designs rival that of your favorite nail art. While Awolola doesn’t have an official site (yet!) she does take orders from the brand’s Facebook page and IG handle. What the beauty world needs more than ever are energetic talented entrepreneurs eager to make other Black women feel beautiful, both inside and out, like Awolola.